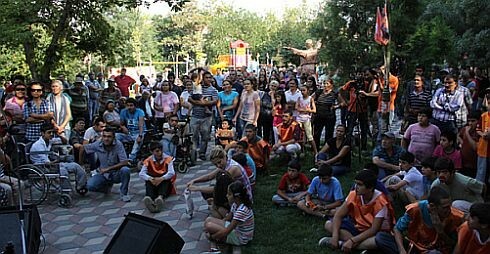 Dozens of Gezi Parkers gathered in Mamak Halkevi in Ankara on Sunday after the appeal “Bring your book and attend our concert” – a campaign that aimed to turn the house into Ethem Sarısülük Library. Dozens of Gezi Parkers gathered in Mamak Halkevi House in Ankara after the appeal “Bring your book and attend our concert” – a campaign that aimed to turn the house into Ethem Sarısülük Library. The opening ceremony took place on Sunday in Ankara’s Feyzullah Çınar Park. Volunteers from Güvenpark and Çayyolu Atapark forums brought along their book donations which were registered at a desk in the park. Gezi Parkers enjoyed the musical performances of Mustafa Özarslan & Grup Çığ, Ali Mahsuni Şerif, Erdal Beyazgül, Aytaç Polat and Serkan Boran. In addition, Tayfun Talipoğlu performed a poetry session. “We have backed up our heritage and acquired our building again in a period where social spaces are so scarce, where municipalities turn green spots into mosques, and where every park emerged as a platform of forums, activities and struggle,” Hamza Doruk Yıldırım from Halkevleri group said in the opening speech. This entry was posted in News, Personal stories and tagged Ankara, Ethem Sarısülük, June 2013 resistance, Memorial library, police violence in Turkey on 26 August 2013 .